There is a lot that Washington can do to boost Taipei’s security in the face of the threat posed by Beijing. Taiwan has a big problem. In 2016, the People’s Republic of China (PRC) began a sweeping reorganization of its military with the aim of creating a joint force capable of fighting and winning future wars. Of all the operations envisioned by the Chinese People’s Liberation Army (PLA), the most heavily emphasized is the Joint Island Attack Campaign, which is code for the invasion of Taiwan. The threat was recently brought into stark relief across the Republic of China (ROC), the official name of Taiwan’s government. In May, the ROC military mobilized for war games to test the island’s anti-invasion strategy, holding the annual Han Kuang exercises, a series of defense drills used to simulate what might happen if China launched an all-out war of aggression against Taiwan. As is typically the case, the 2017 iteration of Han Kuang involved computer-aided command post simulations, civil defense drills, field training exercises, emergency reserve force mobilization, and live-fire drills. Sleepy suburban neighborhoods and small towns across Taiwan were alerted to events by the wail of air raid sirens, the distant rumble of tanks, the scream of fighter jets, and the crunching impacts of gun batteries. Thousands of men, who normally would have put on business suits before going to work in office buildings, instead donned camouflage fatigues and went to work stringing razor wire, emplacing beach obstacles, and manning machine guns along the coast. Taiwan has a compulsory, male-only reserve force, with approximately 2.5 million men in the system. The military mobilizes one reserve brigade (around 5,000 troops) at random each year during Han Kuang to verify that citizen-soldiers can be at their marshaling stations within 24 hours, ready to defend their homes from enemy attack. They represent a latent, but potentially powerful, element of the overall self-defense force. During the recent war games, active duty soldiers, sailors, airmen, and marines had more stressful missions assigned to them than reservists. While most drills were carried out in secret, media outlets were given access to a handful of events, allowing ROC military strategists to showcase capabilities designed to raise public morale in Taiwan, while unnerving Chinese war planners watching from across the Strait. Most observers tend to focus on the air force, naval, and cyber aspects of Taiwan’s defense. In addition to the invasion threat, the island could be subjected to a withering missile barrage, maritime blockade, and internet blackout. The ROC Navy and Air Force are Taiwan’s first lines of defense. 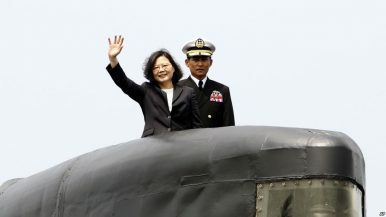 Their versatile combat capabilities form a key component of deterrence, convincing authorities in Beijing that attacks on Taiwan might backfire and turn out to be a disaster for the Chinese Communist Party. Taiwan’s ground forces, on the other hand, are less “strategic” in nature, but arguably just as important. When all else fails, they are the last line of defense. In a worst case scenario, the ROC Army, Marines, and Military Police are responsible for defending Taiwan’s shores and cities. At the onset of hostilities, the ROC Army’s job is to shell and sink enemy invasion fleets from great distances with mobile rocket launchers and artillery batteries. If that failed to turn back amphibious assaults, Taiwanese attack helicopters would rake Chinese landing crafts with missiles and cannons. Next, Taiwanese infantry would pepper the invaders with machine guns, mortars, and bazookas, sowing chaos in PLA units as they motored through lethal obstacle networks laid along the beaches. Farther inland, Taiwanese soldiers would shoot-down enemy helicopters and planes with surface-to-air missiles. If Chinese airborne forces were able to land on Taiwan, local army units would surround their landing zones and overwhelm them. Mechanized infantry and tank brigades are the backbone of the ROC Army. They specialize in rapid response. Their mission would be to wait at hide-sites away from the shore until it was clear where the main focal points of PLA invasion were taking shape. Then they would swiftly smash into beachheads. Supporting them would be Taiwanese special operations forces, delivered by Blackhawk helicopters. In the event counterattacks were routed, massive numbers of Taiwanese infantrymen would hold defensive lines running inland from the beaches, manning traffic nodes like bridges and tunnels. They would fight a long delaying action from bunker networks, tunnels, and trenches along the coast, and if necessary in city streets. Taiwan’s Marine brigades would serve as national strategic assets. Their mission would be to aggressively counterattack any enemy units who might have infiltrated the suburbs of the capital city, Taipei, and the major ports. In addition, they are capable of launching attacks across water to counter-invade offshore island atolls that the Chinese might seize. They could also carry out amphibious assaults along Taiwan’s own coast, smashing into the weak flanks of any major PLA lodgment. Operating in tandem with soldiers and Marines, Taiwan’s well-armed military police units have a number of important responsibilities, the most notable of which would be protecting wartime government leaders from assassination or capture. They would guard many of Taiwan’s most strategic facilities. They would also root out enemy infiltrators, and neutralize spies and saboteurs. Taken as a whole, the ROC ground forces represent the ultimate guarantor of Taiwan’s sovereignty. Yet in spite of their important role, the ground forces have suffered significant cuts in recent years. This has led to reports of reduced readiness and poor morale, with many units operating old equipment and struggling to recruit fresh manpower. These are serious, but not insurmountable challenges. Taiwanese soldiers and Marines are still superior to their PLA adversaries, whose units suffer from endemic corruption and Leninist-style training, heavy on communist indoctrination and light on the development of combat skills. Nonetheless, Taiwan’s ground forces will only stay ahead of the emerging threats they face if they continue to train hard and modernize equipment. In this regard, there is much that the United States can do to help under the Donald Trump administration. For example, the Pentagon could invite ROC Army units to exercises with American counterparts at the U.S. Military’s National Training Center at Fort Irwin, California. In the same vein, ROC Marines could be invited to train at the U.S. Marine Corps Air Ground Combat Center at Twenty-nine Palms (also in California) and the Jungle Warfare Training Center in Okinawa. American military experts in urban and mountain warfare could be sent to teach at Taiwan’s National Defense University and service academies. Overseeing the mission, the defense section of America’s de facto embassy in Taipei could be elevated in terms of both stature and responsibility. Currently, the highest ranking officer in Taiwan is a mere army colonel, not a general or admiral like in Japan, Korea, and China. This is but one of many examples of how much U.S.-Taiwan military-to-military relations are bound by political red tape, greatly restricting what would be routine interactions with any other country. Bilateral defense ties are in desperate need of normalization. Most importantly, the United States could provide Taiwan’s ground forces with the next generation of equipment, potentially including main battle tanks, multiple launch rocket systems, short-range air defense batteries, and mobile field artillery (self-propelled or towed). Regular and reliable arms sales to Taiwan are strategically important for the signal they send regarding Washington’s resolve to meet its commitments under the Taiwan Relations Act and President Reagan’s Six Assurances. They would help bolster morale and confidence in Taiwan’s armed forces, while at the same time injecting uncertainty into the minds of PLA war planners. It is in America’s interest to ensure that Taiwan has the confidence needed to pursue its democratic hopes and aspirations for the future free of Chinese coercion. For Taiwan, such confidence can only come from having a strong military, backstopped by U.S. defense articles and services. Anything else would validate the PRC’s zero-sum tactics and encourage regional instability. Keeping the Asia-Pacific peaceful and prosperous will be a team effort, requiring allies and partners like Washington and Taipei to work more closely together to advance shared interests. Chinese threats to Taiwan are growing. So too must efforts to meet them. Going forward, it is imperative that U.S.-Taiwan defense and security cooperation become more robust. Action should proceed with an eye to shoring up Taiwan’s last line of defense. Ian Easton is a research fellow at the Project 2049 Institute and author of the forthcoming book, The Chinese Invasion Threat: Taiwan’s Defense and American Strategy in Asia. Dee Wu is an intern at the Project 2049 Institute and graduate student at Georgetown University.